Although the Wing Walls are JetBlue's first real foray into the world of digital signage, the project seems to be a natural step for such a forward-thinking company. The Wing Walls certainly add a streamlined, clean look to JetBlue's new headquarters, and they're the perfect addition to a unique space. In it, two monumental open staircases connect the building’s floors. The angular steel and concrete staircases are enclosed by glass railings, and each surrounds one of the Wings—a 40-foot-tall, wing-shaped, back-lit tower. Both Wings are self-standing, exposed structures comprising 14 ultra-slim bezel TVs. The Wing Walls help liven up the headquarters' fifth, sixth and seventh floors. More than 1,000 crewmembers and countless visitors experience the Walls every day. Their content ranges from colorful branding, patterns and JetBlue tailfins to crewleader announcements and recognition and corporate communications. Griggs said the Walls also feature the company's live Twitter feed, which encourages crewmembers to interact and give feedback. QR codes and website links often appear to further engage viewers, who can scan a QR code for instant information or check out a link once they get back to their desks. Both Griggs and Vazquez worked closely on the creation of the Wing Walls. Since this type of digital signage project was entirely new to JetBlue, they collaborated with outside experts to plan and execute the complicated installation. JetBlue's architect worked with integrator Saddle Ranch Digital and a third-party consultant, Digital Signage Experts Group, to determine how to best showcase digital signage in the headquarters' unique stairwell. In the end, each Wing Walls' 14 Samsung screens were masterfully installed, without bevels, to create a clean, fluid appearance. Creating engaging, entertaining content to fit the unique Walls was another substantial challenge. Luckily, people within JetBlue were open to the massive undertaking as well—and were more than happy to get involved. “We have to give a lot of credit to our corporate real estate team, because they were the ones who really figured out how the form would take shape and be engineered," Griggs said. "It's a big thing – it's daunting, it's heavy. Fourteen screens, as you can imagine, and they're big too. They figured out the installation of all that. The challenge for Chris and I was to see how it tests itself out, and we couldn't see that until everything was done and installed." 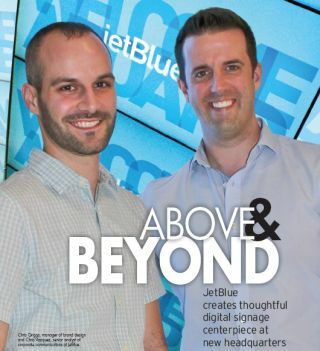 Over the course of four months, Griggs and Vazquez and their teams worked together to create JetBlue's first animated design elements. Until the Wing Walls came along, the company's logo and imagery were really only used in static installations. “We basically started from scratch to develop the animation together, using some of the brand outsets that we had and then working with the corporate communication team to communicate essential messages that had to be put out,” Griggs said. In the weeks before JetBlue's big open ceremony at their new headquarters, Griggs and Vazquez could be found testing and retesting the Wing Walls to ensure all the elements were coming together correctly. Now, Griggs' and Vazquez's departments continue to coordinate on the Walls' content and branding. Corporate Communications owns messaging and content, while Brand Design handles visuals and design elements. “We're really teaming up to do this,” Griggs said. The pair use Hiperwall software to manage the Walls' content, enabling them to combine still images, high-definition video and even live data feeds to make their vision come to life. They're able to set up a “playlist” to tailor content to specific days or events or even to welcome important visitors. With any complicated digital signage project, there are always unexpected complications and lessons learned. In JetBlue's case, creating the initial Wing Walls content was a bigger project than expected. The Wing Walls especially create a challenge, due to their unique size. Each viewer sees the Walls from his or her own angle and for different amounts of time. That insight comes in handy when Griggs and Vazquez are developing new content. Now, they're able to strike a balance that produces content that is neither too slow nor too fast for the average viewer. Another unexpected challenge: Having to re-imagine JetBlue's branded elements for animation. Since the brand had previously only appeared in print, Griggs and Vazquez had a lot of decisions to make—quickly. In the end, the teams were able to collaborate and create content that is on-brand and on-message, and has the “wow” factor that JetBlue was seeking. Already, the Wing Walls have been a huge hit with crewmembers and visitors alike. Now that JetBlue has entered the digital signage world, there's no looking back. Since high-tech, streamlined and sustainable methods of communication are such a big part of their culture, it only makes sense for the company to expand their efforts. For this forward-thinking airline, digital signage—and all that it entails—is the perfect fit.